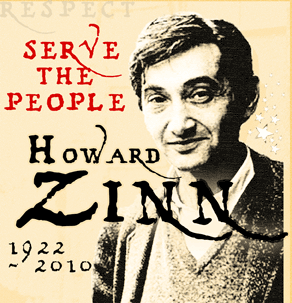 It is with the greatest sadness that we mark the passing of Howard Zinn. History Is A Weapon is an anonymous project and will always remain so, but Zinn's life, his work, and his words have played a big part of my life, to such an extent, that I can't possibly do justice to his memory and legacy just yet. It almost hurts to type this, but as he quoted Joe Hill in Voices of a People's History of the United States, "Don't waste time mourning. Organize!" "The power of the people on top depends on the obedience of the people below." Here's to a man who not only wasn't afraid to disobey, he inspired and prodded all of us to take revolution into our own hands. Such a person's presence is forever required on this earth. He could have lived to be 120, and we'd still be sad for his absence. =( Rest in peace...and may we do well by your teaching.